Since starting out as a freelance photographer in 2000, Terry has built up a reputation as one of the UK’s foremost wildlife photographers. He has won multiple awards for his work and his images often carry a strong conservation message. Terry’s desire to document his subjects in greater detail led him to explore the possibilities of camera trapping. Terry has refined his set-ups, and camera trap photography now forms an invaluable part of his portfolio. He has built up considerable expertise in the field, and he is now leading workshops in the UK to help other photographers learn how to master this challenging, but rewarding form of photography. 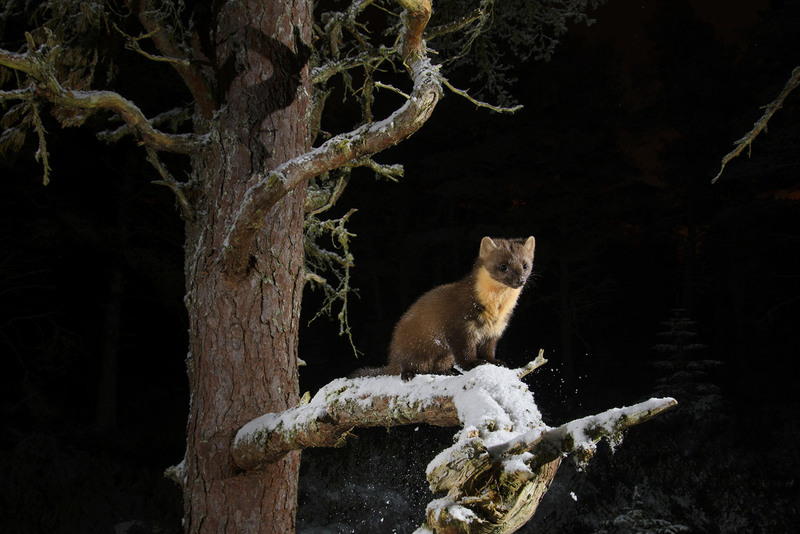 Pine marten on a snowy branch. Download Your Free Remote & Camera Trap Photography Guide! Learn all about remote and camera trap with this free guide from Camtraptions. 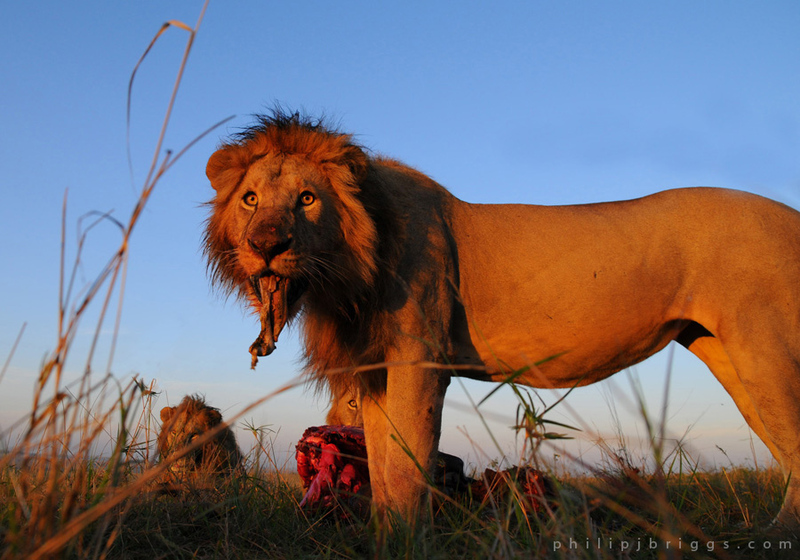 What inspired you to get involved with remote and camera trap photography? Necessity really. Around 11 years ago I was documenting a trial reintroduction of European beavers into a Kent nature reserve. 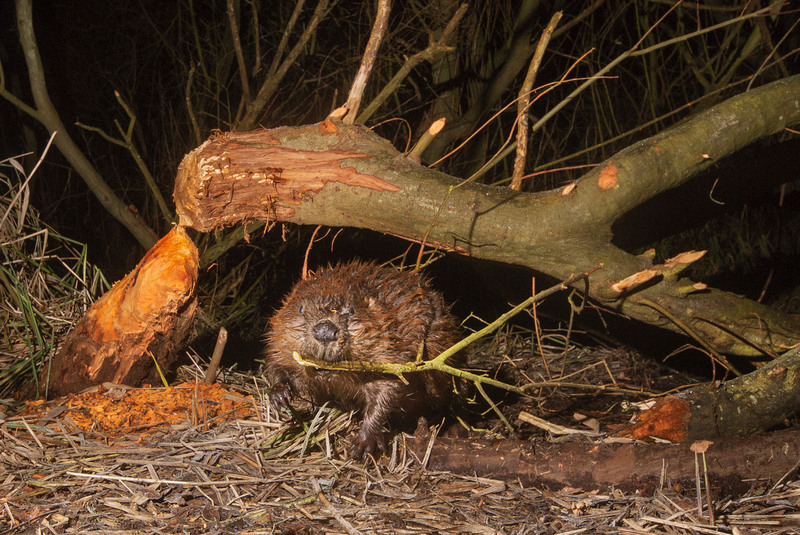 The idea behind the project was for the beavers to manage a wet woodland naturally, reducing the need for machinery and manpower to do the work. Although I was getting images of beavers in the water during the last hour or so of daylight I had no way of photographing the beavers cutting down trees and opening up the woodland, which was rather the whole point of the exercise. I was aware of the work on tigers and the Congo done by “Nick” Nichols for National Geographic which I found original and edgy. And I already had the rudiments of a set up including a Trailmaster beam unit and had been playing around with it with little success. The beaver project meant I had to get serious about camera trapping. What I didn’t realise at the time was what a steep learning curve it was going to be. European beaver in Kent, UK. What do you find are the advantages of using these techniques? I think the advantages differ a little depending on whether we are talking about remotely triggered cameras where the photographer is present but some distance away and camera traps where the photographer isn’t in the area at all. Remote photography where the camera is usually triggered by a radio signal e.g. Pocket Wizards, enables close up, wide-angle shots that place an animal that might not tolerate a close approach, in its environment. This technique also facilitates close ups of animals too dangerous to approach. Camera traps take it further, particularly with regard to animals that might only pass through an area infrequently or won’t tolerate people in the vicinity at all. 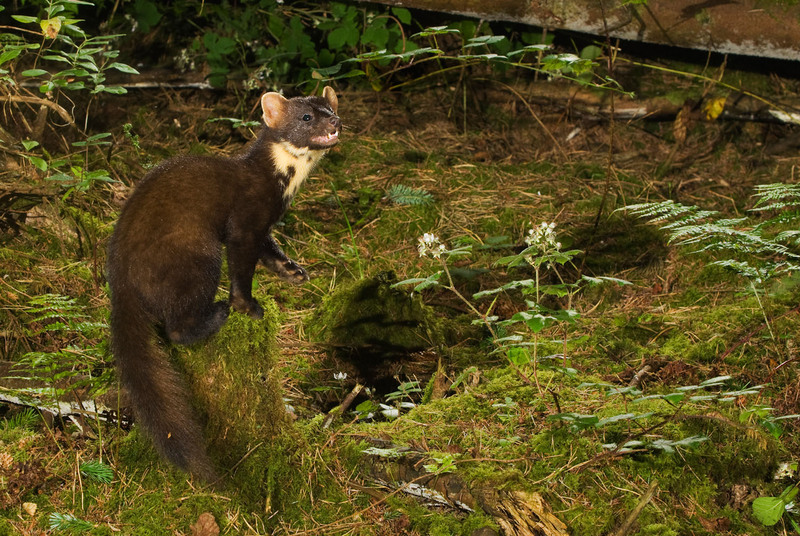 Not long after the beaver project, I was working on pine marten research in Ireland. 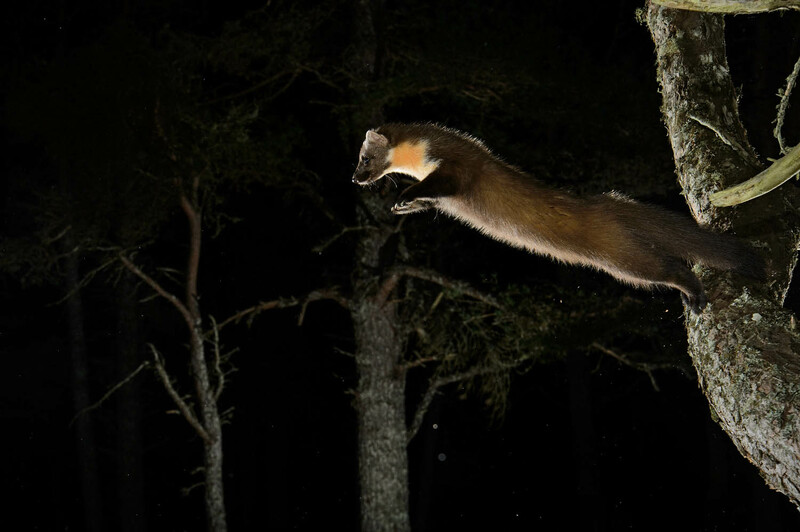 I spent every day for a week in a small, canvas hide and didn’t even see a marten, even though they had been showing up on trail-cams during the day. I had a camera trap set up in the forest and was getting hits every night, sometimes less than an hour after I left. I took a day off from the hide and got a daytime hit. Back in the hide and nothing. It was obvious those martens wouldn’t tolerate me in the forest at all. Every image I got of a marten in that forest was by camera trap. A shy pine marten in Ireland. 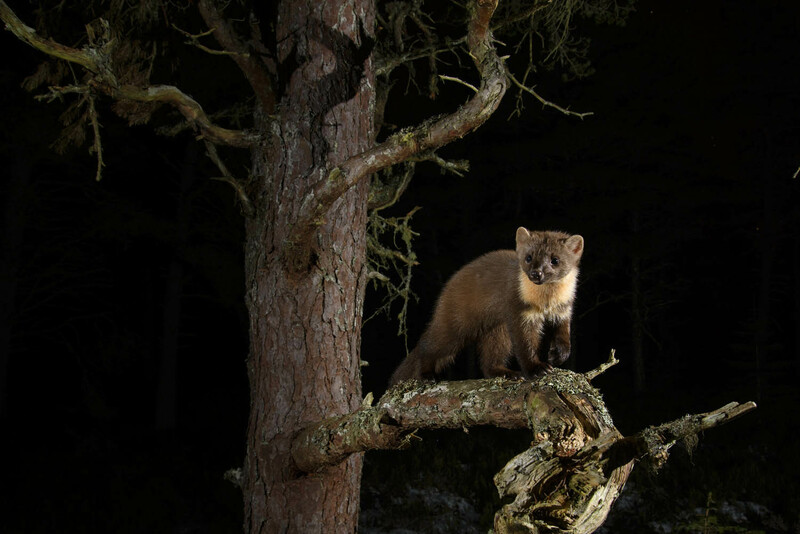 "I spent every day for a week in a small, canvas hide and didn’t even see a marten, even though they had been showing up on trail-cams during the day… It was obvious those martens wouldn’t tolerate me in the forest at all. 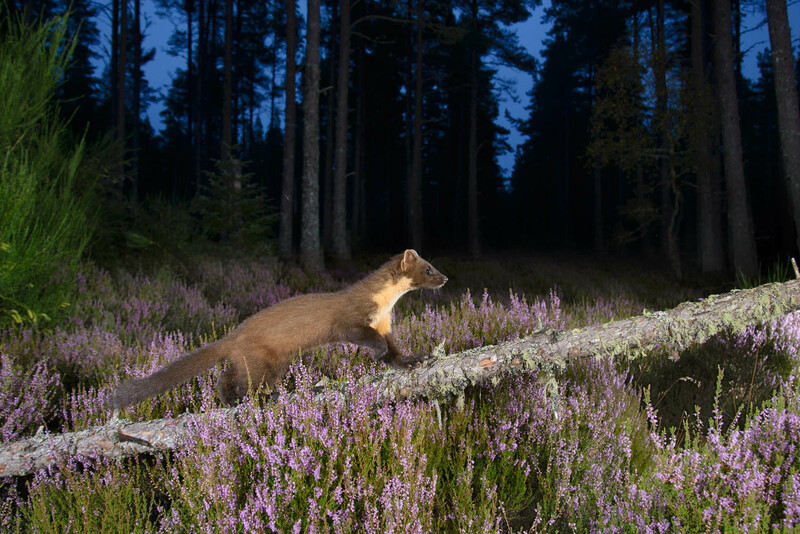 Every image I got of a marten in that forest was by camera trap." The equipment for camera trapping can get quite complicated. What kind of set-ups and kit do you tend to use? I use what seems to have become the standard set up. A DSLR camera in a waterproof case, linked either to an active (beam) sensor or a passive (motion/heat) sensor. Then flashes triggered either by ethernet cables or more usually now wireless units. When I first started with camera traps there was no commercially available kit and everything had to be jerry-rigged. My main problem in the early days was finding a way to allow flashes to sleep and then wake up in time for the first trigger. For ages I struggled with external battery packs which were just another element that could, and frequently did, fail. I’m not skilled in modifying electronic equipment but eventually through trial and error I figured out a way to daisy-chain TTL cables, splicing in extra lengths, which enabled the flashes to sleep and wake up. I was immensely pleased with this progression, even though the cables were heavy and a pain to make. However, this breakthrough came just before the availability of ethernet cables and connectors which did the same job but were much lighter, more reliable and less fuss! It’s incredible how rapidly camera trapping equipment has developed from those early days to Camtraptions, where pretty much everything you need can be bought off the shelf. Apart from the basic photographic stuff, a lot of my kit comprises small tripods, clamps, stakes, bank sticks and flash covers. I’m constantly trying to keep weight down for sets that involve a long hike in. 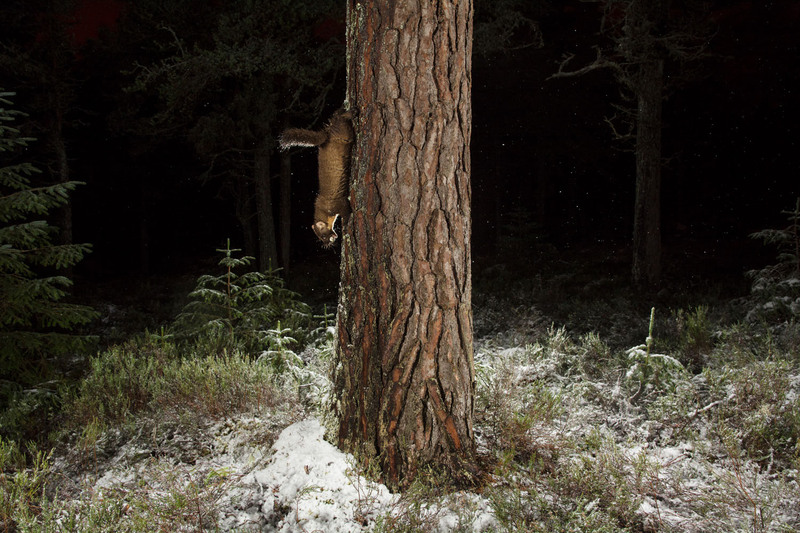 Pine marten climbing down a tree. Behind the scenes of my pine marten set up. Lighting nocturnal scenes for camera trap photography can be quite an art. How do you normally approach this? My first consideration is to try and bring some ambient light into the equation. 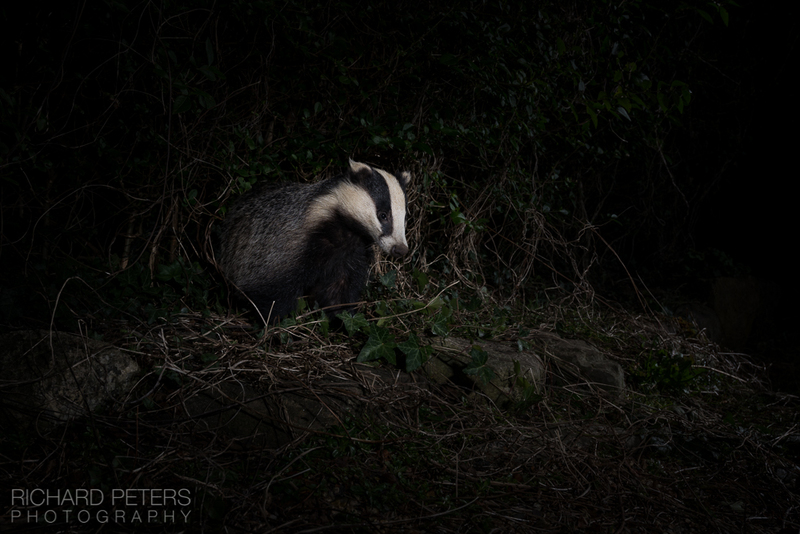 Almost all the UK mammals I camera trap are completely nocturnal so most hits are in complete darkness. It’s still possible to bring out some light in the sky with long exposures but this has its own issues, not least light pollution if anywhere near a town or even road lights. 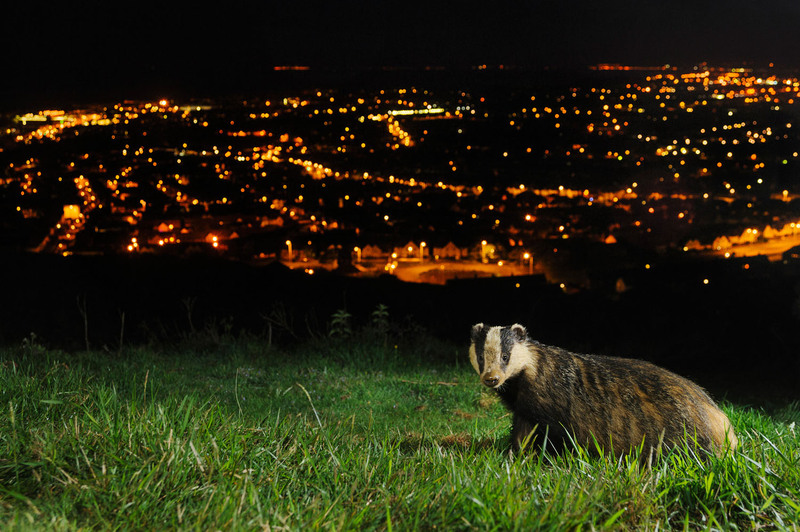 Luckily quite a lot of the camera trapping I have done is of urban wildlife so this can be included in the image. I usually have one main flash and then another to fill and if the subject is a dark animal against a dark background, I’ll try to bring in a backlight as well. On more elaborate sets I’ll use extra flashes to light the background. 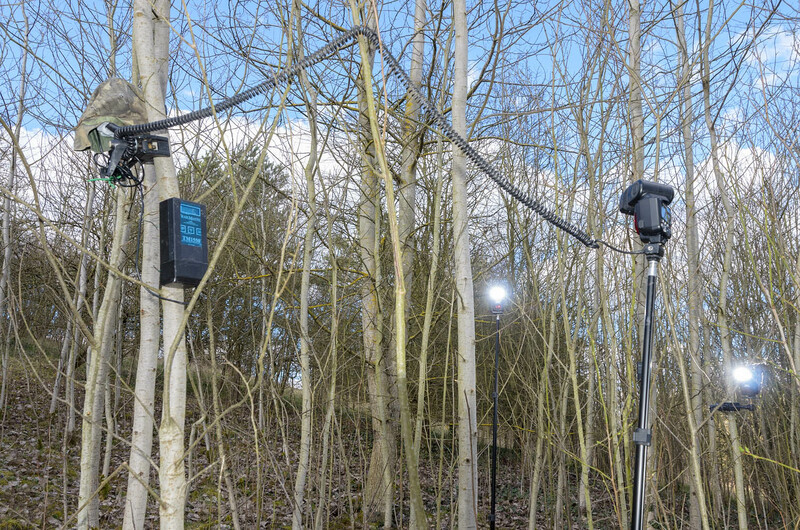 Flash exposure is always tricky when setting up in full daylight and trying to visualise what it will look like at night. I have enough experience now to make a reasonable guess at what effect I will get at various flash, settings, ISO, aperture, distance etc but I usually have to tweak the settings after the first hits. Combining flash and ambient lighting can be difficult to get right, but the results can be amazing when you pull it off. "I usually have one main flash and then another to fill and if the subject is a dark animal against a dark background, I’ll try to bring in a backlight as well. On more elaborate sets I’ll use extra flashes to light the background." What has been your favourite remote photography project to date? Can you share some of the photos and how they were taken? That’s a tricky one. I think my favourite is probably a population of foxes living on a railway embankment the I photographed over several years. These foxes made use of both urban and rural environments denning on the railway that separated a large village from fields and woodland. They would hunt rabbits and forage on blackberries in the fields whilst also being fed in the gardens of several houses around the village. I photographed them from a hide with a long lens but the most intimate and informative images were made with camera traps. The progression of this long-term project mirrored my own experience with camera traps, starting with basic camera in a plastic bag and one flash, to more elaborate and technical images. 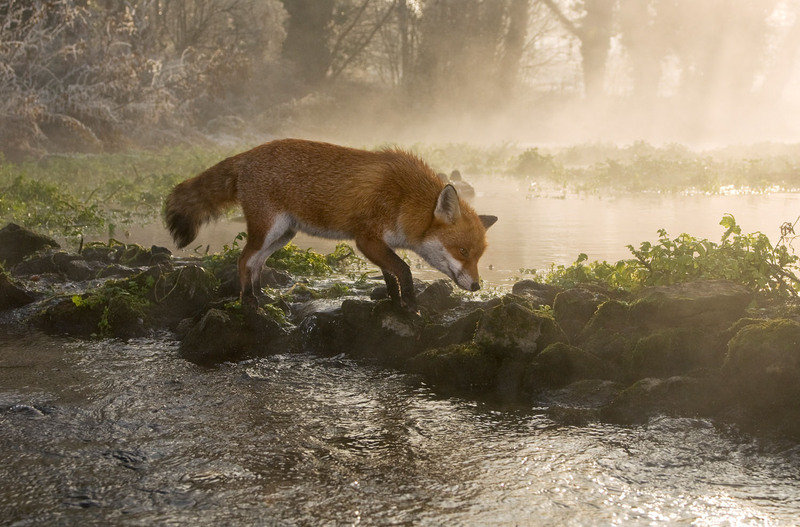 Fox walking across a stream. What is the biggest challenge you have had to overcome in this project and how did you do it? There were two main challenges to this project. One I eventually overcame and one I didn’t. 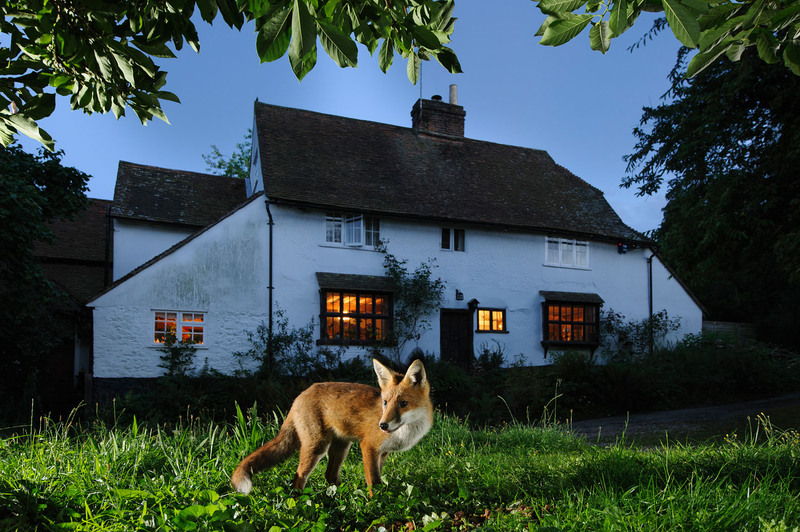 Firstly, although the foxes spent some of their time in an urban environment, they spent most of it in the rural countryside, which in the UK means guns, traps and persecution. They were extremely shy and at the slightest hint of human they would be gone. They were also very nervous of camera traps and wouldn’t go near them, which was a problem as I really wanted a wide-angle shot with a train in the background. I had good shots of them crossing the stream that cut their territory and in the gardens of people that were feeding them but not the railway shot that “tied the room together”. There was an old broken down fence where foxes regularly crossed from a field to the railway so I made a mock up camera and flashes that looked like my kit and left it in place for weeks. Then I replaced the dummy with my set up and eventually got the shot I was after. The second challenge derives from the first in that the reason I didn’t leave a real set up in place all that time was that, although this was on private property where I had full permission to work, over the course of the project more and more people were coming on to the land. Early in the project I had a camera trap stolen but considered it a one-off. A few days after I got my train shot I had 2 complete set-ups taken. Cameras, sensors and 6 flashes. The only thing these two criminal masterminds missed was the trail-cam that filmed them in the act, leading to their prosecution. My insurance company replaced the equipment (under a pre-existing arrangement, they won’t insure me for cam traps now) but it brought the project to an end. 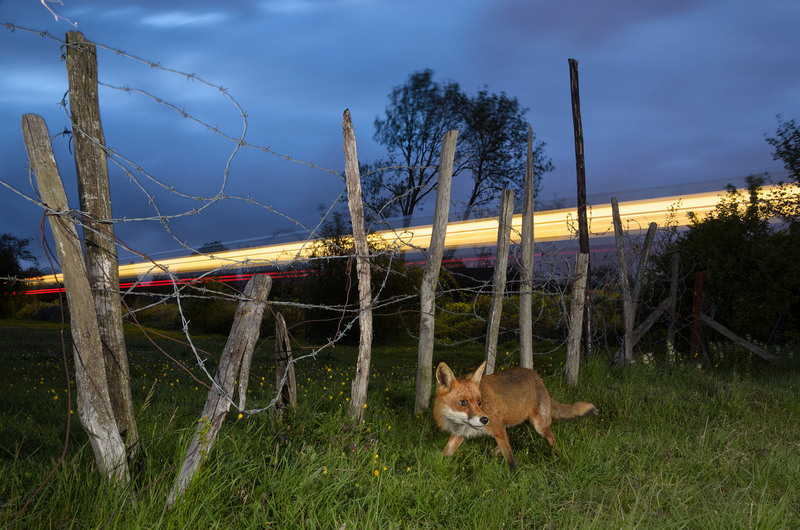 Photographing these shy foxes by a railway was my most challenging project to date. Do you have any useful camera trapping tips for someone who is just getting started? I think there are two main things I would say. Firstly know something about your target species. Just the basics of its ecology and behaviour. Secondly, learn to light. Many photographers, even experienced ones, seem to be a bit afraid of flash so find all kinds of reasons not to use it. For camera traps it’s pretty much essential. 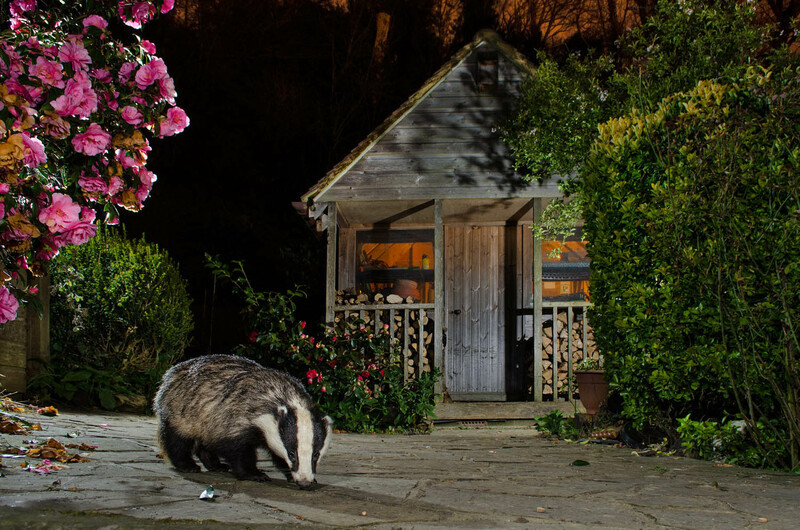 Setting up camera traps in your garden can be a great way to practise difficult lighting techniques. 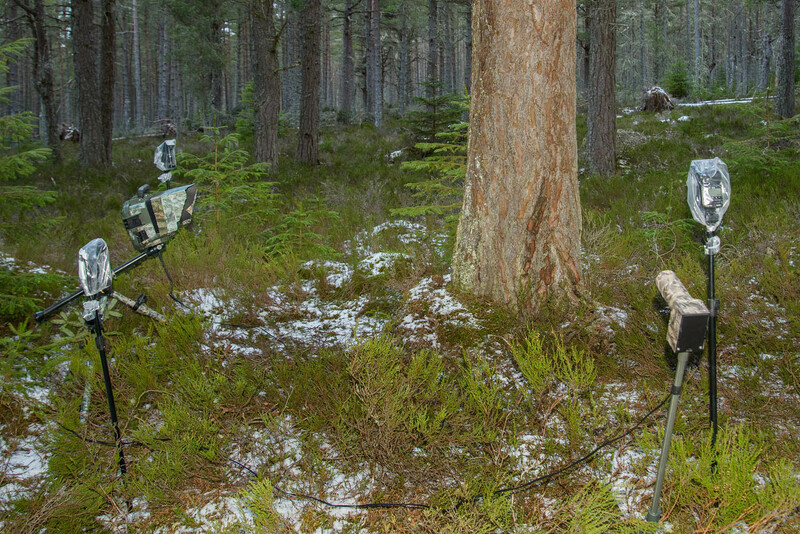 You’re running a camera trap workshop in Scotland in 2018 – can you tell us a bit about that? I get quite a few requests from other photographers for help with camera traps. 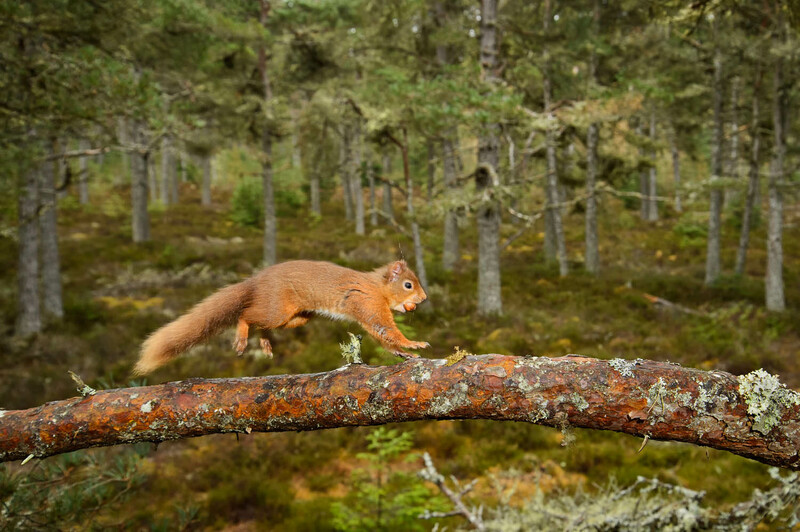 I always help where I can but it’s difficult to explain this stuff in the abstract, so James at Black Isle Nature Photography and I decided to run a workshop at his pine marten site where photographers can either use their own kit or ours to learn the basics. We’ve camera trapped at this site for quite some time now and it’s provided some excellent images. The martens at this site raid his squirrel feeders pretty much every night so we hope to get plenty of hits on the cameras to work with people on different lighting scenarios and compositions. 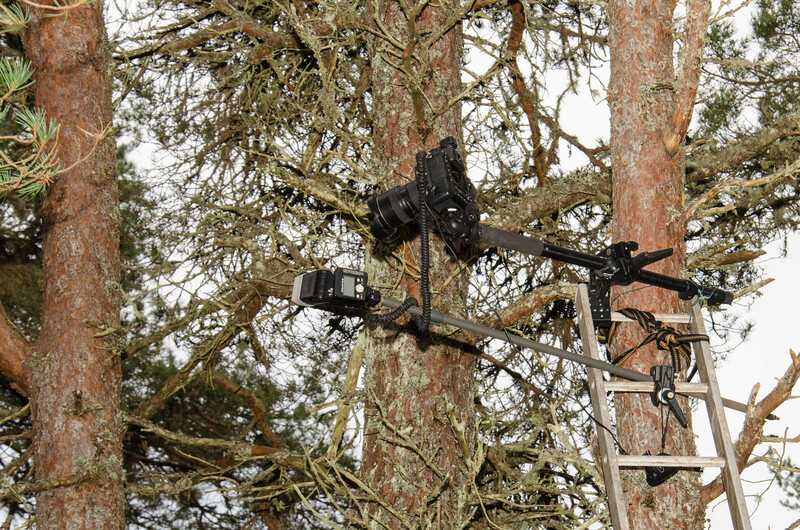 We’ll do radio-remote images of squirrels during the day and set up camera traps for martens in the evening. 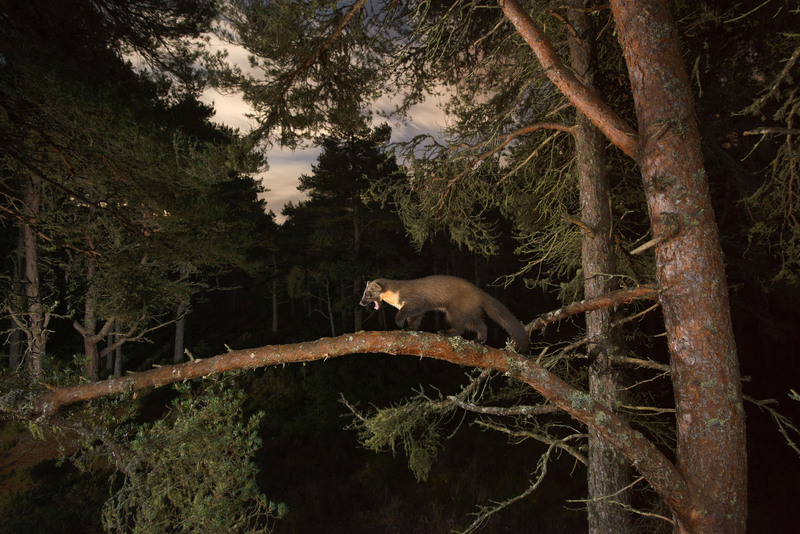 A pine marten photographed on my Black Isle Hides camera trap workshop. Pine marten climbing up a tree. Here are some more of Terry’s images. In each case you can see the set up that he used to capture these incredible photographs. Camera trap to photograph dormice. 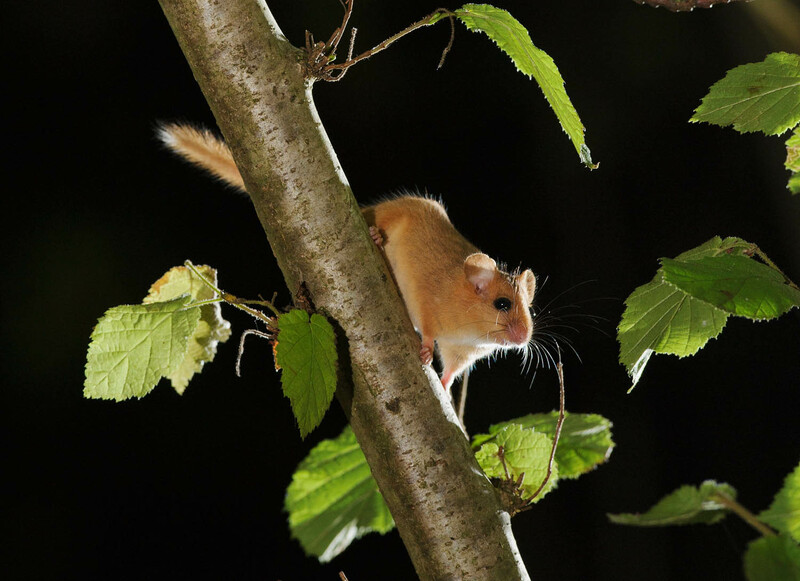 Hazel dormouse (Muscardinus avellanarius), Kent, UK. Camera trap to photograph red squirrels. Red squirrel (Sciurus vulgaris) Black Isle, Scotland, UK. 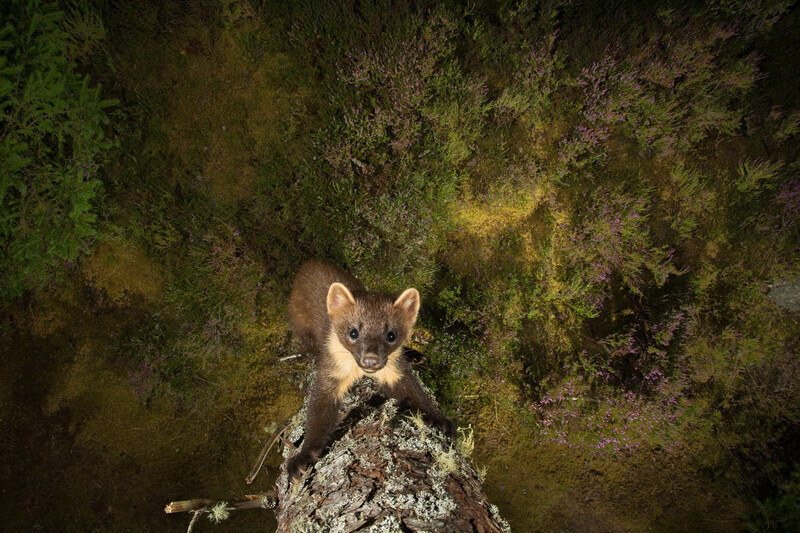 Using a soft toy to compose and test the lighting for a pine marten camera trap. 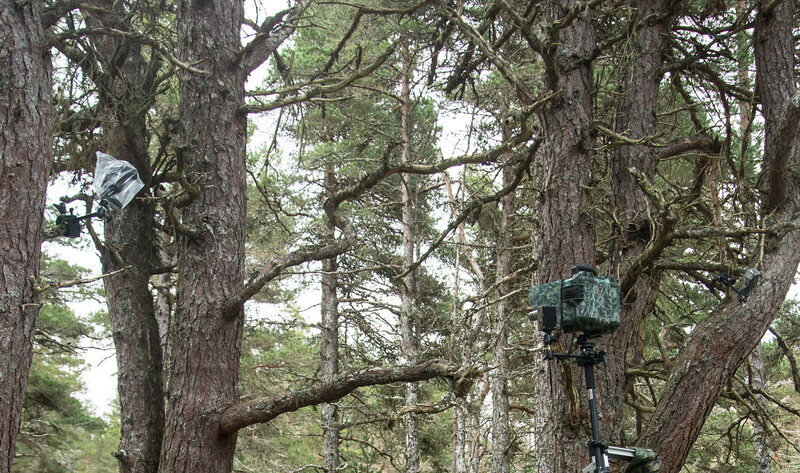 Camtraptions PIR camera trap used to photograph pine martens. 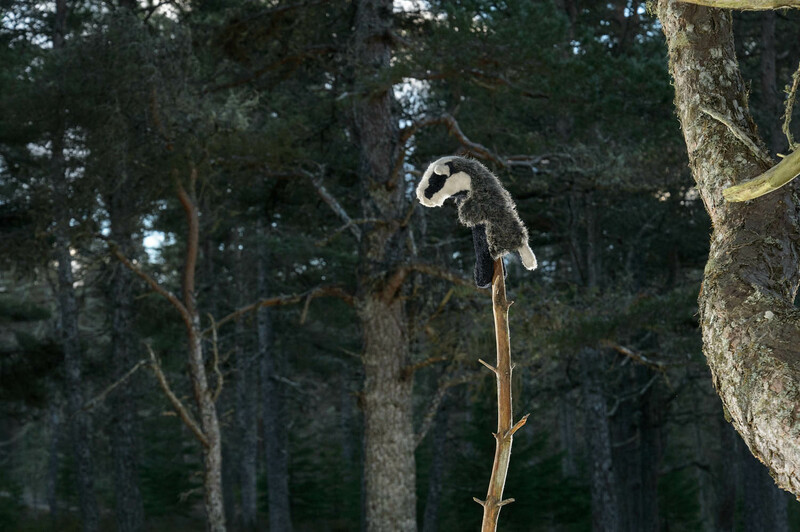 Pine marten climbing a branch. To see more of Terry’s amazing wildlife images, please visit terrywhittaker.com. If you would like to find out more about the camera trapping workshops that Terry is running with Black Isle Hides, then please visit blackislehides.co.uk.